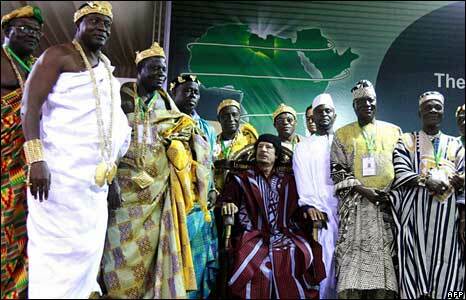 A meeting of more than 200 African kings and traditional rulers has bestowed the title "king of kings" on Libyan leader Muammar Gaddafi. Africa's political leaders are lukewarm about his vision of merging their powers to create a single government. "We want an African military to defend Africa, we want a single African currency, we want one African passport to travel within Africa," Col Gaddafi told the assembled dignitaries, who come from countries such as Mozambique, South Africa, Ivory Coast and the Democratic Republic of Congo. The BBC's Rana Jawad in the Mediterranean town of Benghazi says Libya's leader wants them to create a grass-roots movement to press Africa's political leaders to sign up to his vision. Sheikh Abdilmajid from Tanzania told the BBC that the traditional rulers could play an important role. "The people believe in the chiefs and kings more than they believe in their governments," he said.